Available in Orchid White or Classic Black,this tall, freestanding light source lends a soft ambient glow to contemporary spaces. Diffuse, shaded light provides a practical solution to harsh brightness. Brightech's Maxwell USB Shelf Floor Lamp softly illumines your office, bedroom, meditation corner, or alternative therapy healing space, thanks to a translucent, off-white shade surface concealing the bulb on all sides except the top. Love it for the softness of the light and the look.Combine two of these floor lamps in the same roomfor moments when you desire greater illumination or simply need extra light to read by. 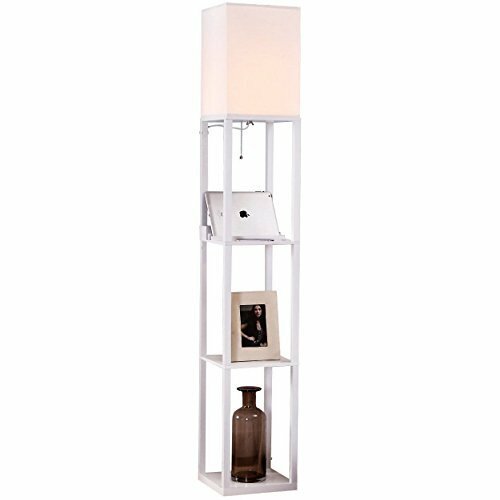 A decorative lamp intended for use within intimate spaces, this open frame structure with three tiers of display shelves complements modern minimalist décor schemes that have a Scandinavian or Japanese influence.Two USB ports on the top display tier add practical convenience.Charge up your laptop, phone, Kindle, or other mobile device. There's even a built-in US plug for providing power to clock radios and all electronics in need of an outlet. Keep your lamp on for hours at a time and never worry about it overheatingwhen you use energy-saving CFL bulbs or LEDs. Your light will be warm and expansive without generating heat. Light reflects to the ceiling; easily switch on/off with a pull chain approximately 4 feet from the ground.Required assembly with a Phillips screwdriver takes approximately half an hour. Shelves are not adjustable in height. Due to the lightweight design of this floor lamp, we recommend situating it on hardwood floor surfaces, tiled flooring, or delicate rugs and not upon thick, shag carpets. Cat owners are advised to anchor the lamp base securely for added stability. CHARGE LAPTOPS & PHONES: 2 USB ports conveniently recharge your mobile devices including iPhones and Android devices. The shelf features a US electircal outlet to charge a laptop, tablet, iPads etc. ALEXA COMPATIBLE A COOL CONTEMPORARY LOOK: This lamp can work with Alexa, Google Home or smart outlets. Besides the great function, it comes with great style. Off-white shade, open at the top, softens brightness of bulbs for a diffused glow that's easy on the eyes for a warm, serene feeling with no excess heat. 20,000 HOUR LIFE LED BULB INCLUDED: The Brightech Maxwell USB lamp includes a 9.5 Watt, 800 lumen power saving LED bulb so that you will never have to replace a bulb. It's advanced 3,000K warm white LED technology allows this lamp to outlast energy burning halogen or incandescent bulbs. Save money and energy with the Maxwell. Note: Bulb not dimmable.